A new wonder from Logitech to impress the gallery!!. It is flying which resembles to so many others will say you? You are mistaken, Formulated it Vibration Wheel Feedback is flying which offers rather particular feelings that it is necessary it to have under the hand to try out them. 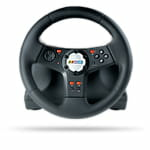 For you who have this wheel, here the updated driver. Latest update on June 9, 2016 at 05:55 AM.